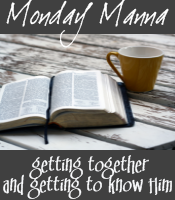 Welcome to my contribution to "Monday Manna" at Exemplify. Don't miss the other wonderful thoughts on this weeks verse at Kristen's blog, and feel free to post your own! My heart says of you, "Seek his face!" You can tell a lot about a person from their face. Emotions show on the face more than even words sometimes. Facial expressions can show us joy, anguish, confusion, frustration, peace. So what does it mean to ME to seek God's face? In my view, God's face shows what is important to him. What makes my Lord smile? What turns his countenance to sadness, pain, or laughter? What aspects of our world--or of my thoughts, actions, and words--bring my Lord joy, and which bring Him sorrow? But seeking His face is more than just knowing. Most importantly, I want to align my actions, thoughts, and words with the face I long to see on my Lord. It should grieve me if, when I find His face, the expression is one of sadness, disappointment, anguish. My goal is to make His face full of joy, pleasure, and peace. And if I DO find an "unpleasant" face on my Lord, I should long to make it right. Great post, Joanne. Thank you for sharing your heart and your prayer. I hope you don't mind that I joined you in praying! :) Monday blessings to you, my friend! His love is written all over your face and in every word you write. Great post! Great post - I love this way of thinking of seeking God's face! "My goal is to make His face full of joy..."
I love that. I love this. How true is that? Thanks you SO much for writing this and letting it be a part of Monday Manna.